If you were to be a superhero, I am quite sure most of you would already pick latent abilities such as being a mutant or celestial being, instead of the Batman type who is just a masked crusader with plenty of money stashed away while aided by mad martial arts skills and a bunch of gadgets that would make James Bond turn green with envy. However, I don’t think that Batman’s arsenal of weapons are not complete until he has the Switchblade Boomerang. You might just beat Bruce Wayne to one of these puppies though by placing an early pre-order, with shipping expected to commence this coming June 2nd. The Switchblade Boomerang will retail for £12.99, where it helps you kick start your crime fighting career as it is made from three spongy, spring-loaded blades, and is highly portable since it can fold up and slide easily into a pocket, bag, or utility belt. 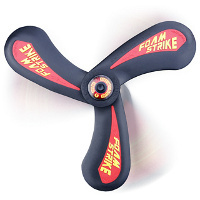 In ideal situations, just press the central button and watch the three foam blades fling out and lock in place. Throwing the Switchblade will see it return to you in an arc, but a little bit of practice is always recommended if you do not want to fumble in public.